No one knows where the wheat plant originated, although it was cultivated where modern people supposedly first appeared- in Southwestern Asia. As early as ten to fifteen thousand years before Christ, people probably used wheat as food. In 1948, archeologists from the University of Chicago uncovered an ancient village in Iraq, established 6,700 years before. In the ruins they found two different kinds of wheat similar to those grown today. The first people were probably wanderers, who roamed with their families through forests and grasslands in search of the food they needed to keep alive. When these people discovered they could eat the seeds of the grass known as wheat, they probably marked the place it grew and returned again, year after year. Over centuries they found that wheat could be stored, to serve as food during winter and as seed for a new crop in the spring. Because wheat grew better where soil and rainfall favored the plant, the family of man stayed nearby. To stay near wheat and claim crops, early people fashioned some kind of shelter. Where the land was plentiful and good for growing food, other families also came and joined together in villages for mutual protection. No longer forced to move from place to place, people found time to think and plan to improve crops, shelter, and way of life. Seasons were observed and people became more conscious of time. The nomad people slowly became farming people. The need for trading ideas, and for understanding one another brought development of language, and later, symbols were devised for communication, the beginning of writing. The seeds of wheat became the seeds of civilization. So many foods today are made from or contain wheat that we take it for granted as an accepted and often unnoticed part of our daily meals. 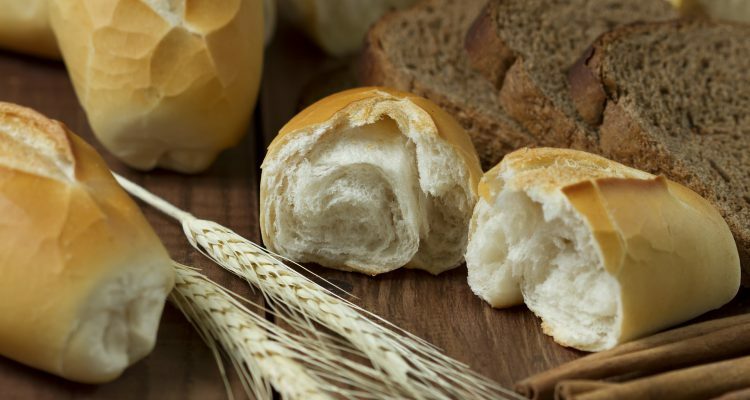 The most popular wheat food is bread, and a form of bread was found in the ruins of the Stone Age village of Swiss lake dwellers. But the first wheat food was probably the grain itself, stripped of its husk, or “glumes,” and chewed. Wheat found in the excavation of ancient cities often appears carbonized as though the husk had been removed by heat. Heating or parching the grain makes the glumes easier to rub off. Other cereals, corn or rice, and perhaps varieties of early wheat, could be popped like what we know as popcorn. The moisture inside the hard outer coat would turn to steam in the heating process to explode the grain. One of the remarkable points about the story of wheat is the fact that it is still eaten in primitive forms in many parts of the world. The early tools of its culture and preparation as a food are still found in daily use, as crude instruments that are the equivalent of those used many thousands of years ago. As people learned to write, the story of wheat was woven into the fabric of history. Bronze tablets dating back from the ninth century before Christ depict the grinding of wheat and making of bread in Assyria. The Greek historian, Herodotus, wrote in the fifth century, B.C., of Egyptian bread baking. Tombs along the Nile river contain murals which show the planting of wheat and harvest, the grinding of flour and the making of bread. Some tombs were stocked with wheat and bread made from coarse meal. The Egyptians also sifted their meal to make white flour and bread, products reserved for the ruling class. Egypt is generally recognized as the place where leavened bread originated. References to wheat are worldwide, from the beginnings of recorded time. Ancient Chinese writings describe the growing of wheat 2,700 years before Christ, and even today wheat is considered a sacred crop in some parts of China. Theophrastos, a Greek, wrote in 300 B.C. of the many different kinds of wheat grown along the Mediterranean Sea. Written records, works of art and the excavation of ancient cities show the progressive advancement of the art of milling and baking in Greece and Rome and through the Middle Ages. Scientists speculate on the discovery of leavened bread. After learning to grind wheat, people probably added water to make a gruel, porridge or “mush.” Porridge left in the open air under favorable conditions will ferment naturally. Such a brew probably was the forerunner of beer, or, with less water, a dough leavened by action of the wild year- something like the “sourdough” bread eaten by American pioneers and prospectors. Baking and brewing were developed together as people gained arts and skills. Of all cereal grains, only wheat offers the property that provides for the cellular structure of leavened bread products.